John Heinz National Wildlife Refuge at Tinicum is where I volunteer and spend a lot of my time. 80 species of birds breed here, and the nesting season has begun. Our stars are a pair of Bald Eagles, but this year they are not to be outdone by the Great Horned Owls. 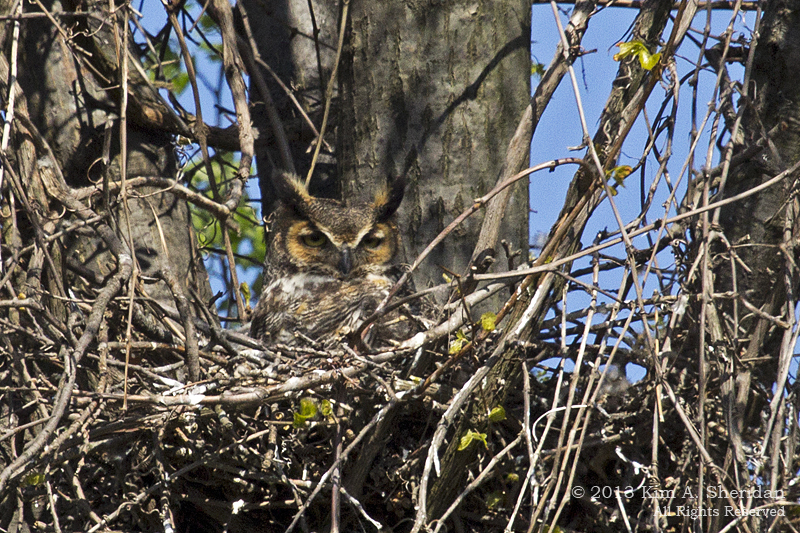 There are two Owl nests this year, each with two chicks. 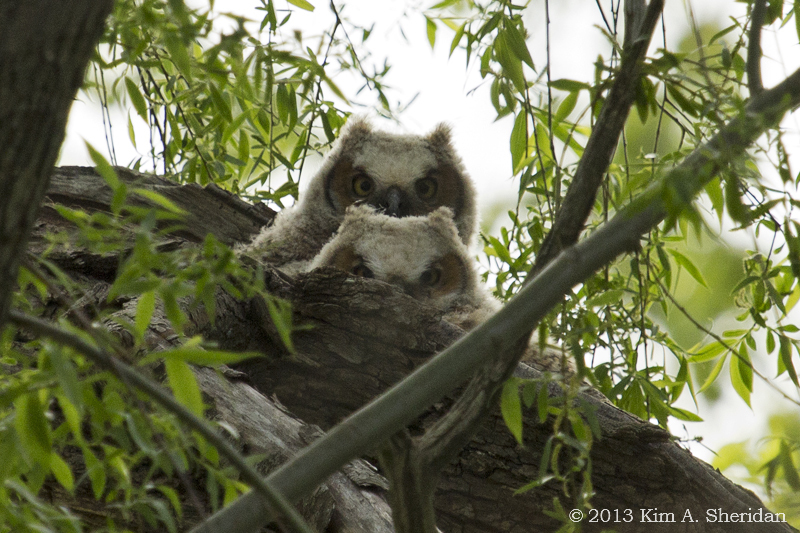 By the time we spotted these Owlets, they were big balls of fluff almost as big as their parents. 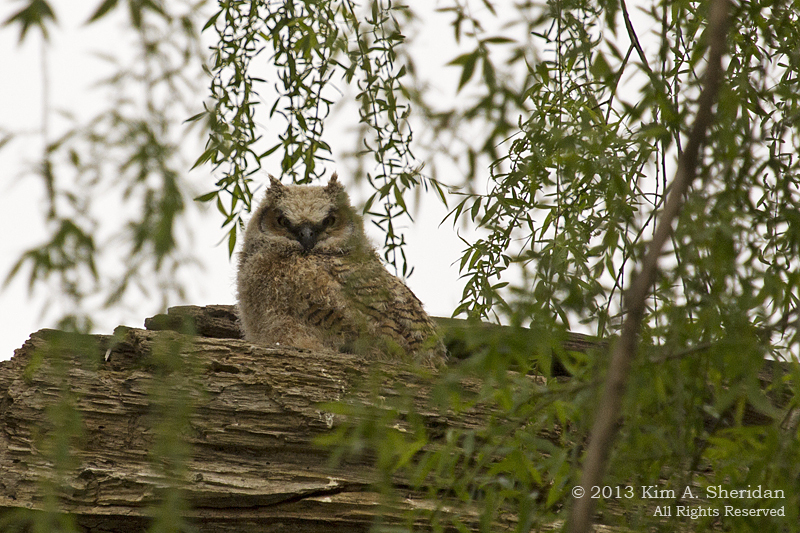 Owls frequently use previously abandoned hawk nests, without wasting time on expensive renovations. In this case, it’s a downed tree trunk. Colleen said they look like they’re riding in a little wooden boat. With hungry mouths to feed, the usually nocturnal owls are more active during the day, and can often be spotted roosting in or near the nest. 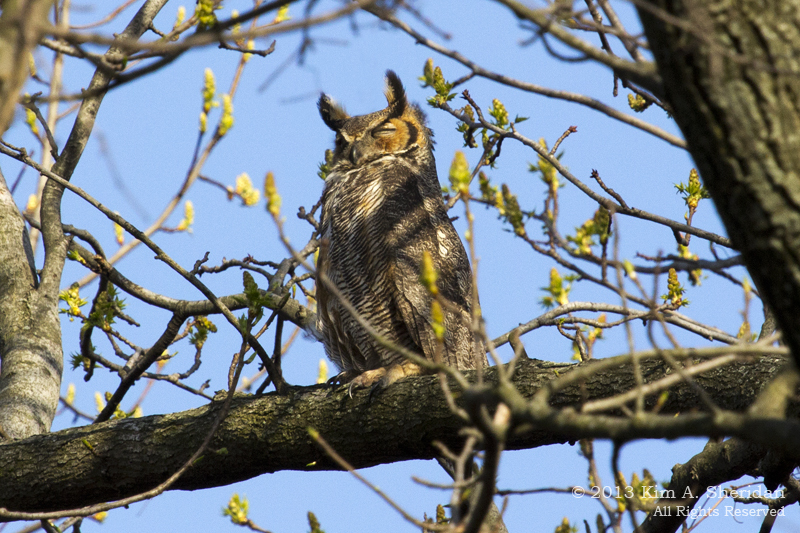 I’d never seen Great Horned Owls before, so this was a treat. Both sets of owlets have fledged in recent days, so they’re not in the nests, but they will remain nearby being cared for by their parents for a while longer. This entry was posted in Birds, Nature and tagged Birds, John Heinz National Wildlife Refuge by Kim. Bookmark the permalink. great pictures of the owls! Love the second pic the most. that previous comment was from me! I was wondering! Thanks! The second pic is my fave too – a friend calls them “piggyback” owls. Their eyes never left me the entire time I was watching them!